1. Cook the noodles according to the pack instructions, then drain and rinse under cold water until completely cool. 2. Place half the salad onions, half the ginger and half the garlic in a large saucepan along with the dashi or stock, 500ml water, mirin and 3 tbsp of the soy sauce. Bring to the boil and simmer for 10 minutes. 3. Meanwhile, in a large bowl, mix together the pork mince with the remaining soy sauce, garlic, ginger and wasabi paste. Firmly shape the mixture into 20 even-sized balls. 4. Strain the broth into a large bowl through a metal sieve, then bring back to a simmer in the saucepan. 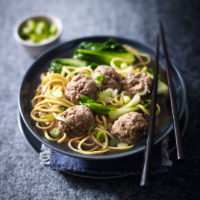 Add the pork balls and simmer for 8–10 minutes until cooked through, then add the pak choi and noodles for a final 2 minutes. Ladle into 4 bowls and serve with the remaining salad onions scattered over. Add any extra cooked veg you like to the broth along with the noodles and pak choi - mushrooms, sweetcorn and beansprouts all make delicious additions.